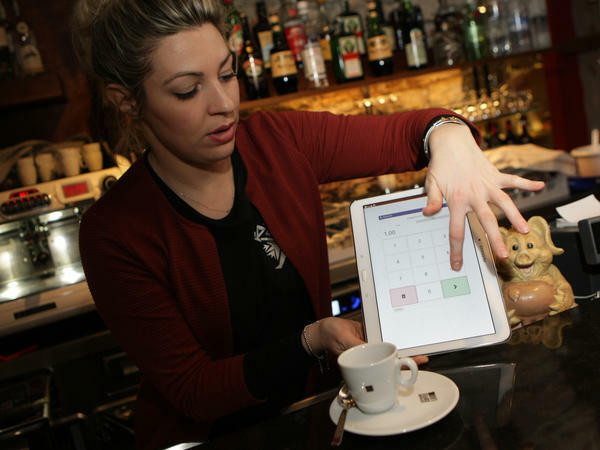 A waitress shows how to pay for a coffee with bitcoins. In 2014, we brought two people together to make a bet over the future of bitcoin. Ben Horowitz, a venture capitalist whose firm had already invested millions of dollars in cryptocurrency companies, thought bitcoin would change the way people bought stuff online. Felix Salmon, a financial journalist, took the other side. He thought bitcoin's rising price would make people unlikely to use it to buy stuff. Recently, we asked a polling company to conduct a nationally representative survey of the public's use of bitcoin, and we're ready to announce those results. Today on the show, we declare a winner. Music: "Alright Alright," "Todo Mundo," "Edge of Fear" and "Hit Me Back."